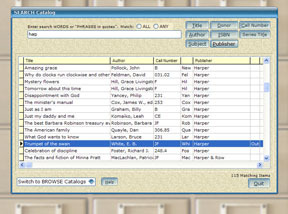 CONCEPT I OPAC gives your patrons powerful catalog searching AND unattended check-out on networked computers. Scaled pricing permits affordable expansion. 1. BROWSE: The familiar 'browse'-style catalog suggests the traditional "card catalog." This style has proven to be quite 'friendly' even for non-computer users. But the ease-of-use does not detract from its power to FIND! Text searches, even misspelled text searches, result in a 'closest match' that is usually 'close enough' ... no unfriendly 'not found' messages. Color and text cues distinguish various categories. Color Flag (|) indicates a MEDIA item. Italics indicates an alternate title or author. Text colors distinguish SERIES and CROSS REFERENCES. 2. WORD SEARCH: Using the Google-like 'casual Boolean' text parsing, searches find items that match full and partial text entries. 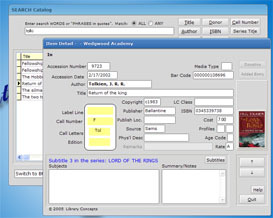 Use the standard search fields (Author, Title, Subject) or alternate fields such as Publisher, Call Number, ISBN and Accelerated Reading® levels. Users can even re-sort the display order. Online HELP will give the patron (and librarian) detailed information about the Catalog's operation... if they should even need it! 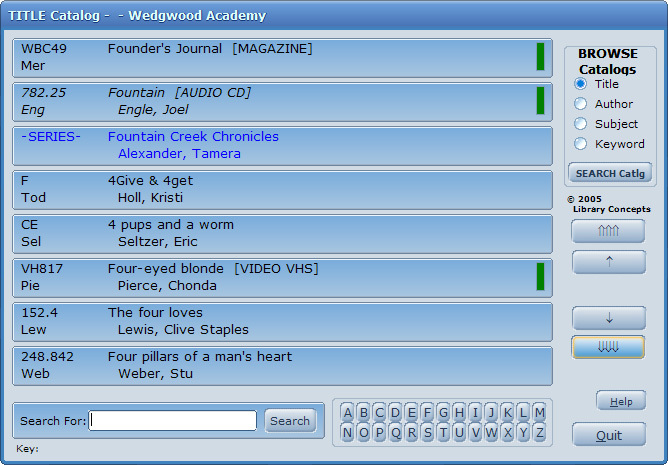 Both BROWSE and WORD SEARCH catalogs link to the individual Item Details. This screen displays the complete bibliograhic record, the copy status and the book cover image. The image links to additional detail such as the Table of Contents, a summary and, in many cases, the first chapter text. The powerful Series grouping includes a one-click link from one Series Title to another. Perfect for the "What's next?" question. Allow your patrons to check out their own materials. Ideal for school libraries with high circulation or for libraries where staff may not always be available. ADMIN-assigned limits and tracking are maintained. OPAC's easy-to-understand screens assure that your patrons will be checking out their materials with very little instruction. An optional PIN can be used for extra security. 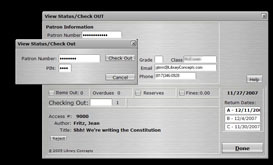 The librarian can define certain fields to display or hide. Select one of five colorful 'skins' to create an attractive screen 'look' and more responsive controls. 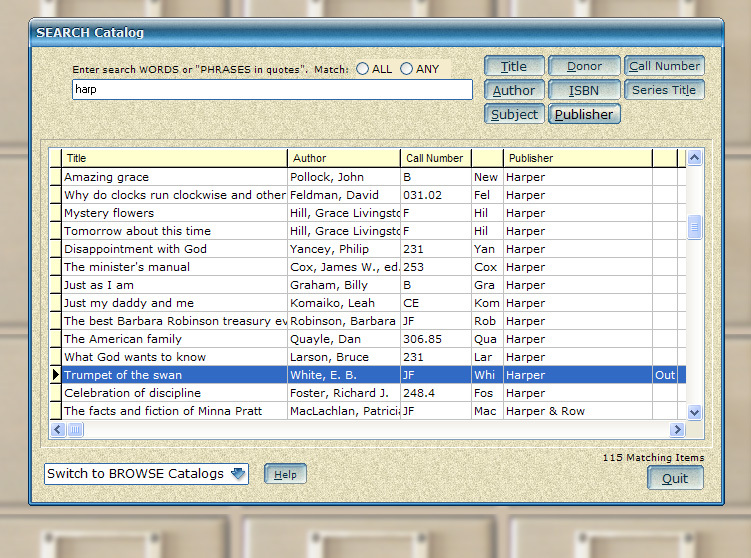 Data changing features are inaccessible to the OPAC user. A password isolates the patron from Preference settings and the ability to exit the program. Network capability is built-in and requires no additional licensing.